本发明涉及一种眼内透镜和通过植入该透镜提高眼的视觉质量的方法。 The present invention relates to an intraocular lens and a method improved by implanting the intraocular lens visual quality. 根据本发明的透镜包括：构造成的植入治疗对象眼中的光学部分；和构造成的至少一种非球面表面，其与眼的囊内晶状体结合，减小穿过眼球的波前像差。 The lens of the present invention comprises: an optical portion configured to be implanted in the eyes of the subject being treated; and configured to at least one aspherical surface, which in conjunction with the lens capsule of the eye, through the eye to reduce the wavefront aberration. 本申请是申请日为2001年12月14日、发明名称为“获得能減少眼像差的眼科透镜的方法”的中国专利申请01821016. 3的分案申请。  This application is filed on December 14, 2001, entitled Application 01821016.3 divisional application is "able to obtain a method of reducing aberrations of the eye of the ophthalmic lens" Chinese patent. 本发明涉及能減少眼的像差的眼科透镜的设计和选择方法，以及能够提供此种改善视カ效果的透镜。  relates to reduce aberrations of the eye and ophthalmic lens design selection method of the present invention, and a lens capable of providing such improved visual grades effect. 除眼的第一阶散焦和散光之外，大量其他视觉缺陷也可能存在，例如当波前穿过折射面时会产生不同阶的像差。  In addition to eye first order defocus and astigmatism, a large number of other vision defects may also be present, for example, when passing through the refracting surface will produce wavefront aberrations of different orders. 波前本身在穿过有缺陷的光学表面时变成非球面性的，而非球面波前落在视网膜上时产生视觉缺陷。 The wavefront itself becomes aspheric when passing through the optical properties of surface defects, generating visual defects spherical wavefront falls on the retina instead. 如果角膜和囊内晶状体不是无缺陷的或者不能完全补偿光学元件，那么它们二者都会导致这些类型的视觉缺陷。 If the capsular bag lens and the cornea is not completely defect-compensating optical element or not, then they both will lead to these types of vision defects. 本文中的术语“非球面性”包括非球面性和非対称性。 The term "non-spherical nature," including non-spherical and non Dui symmetry. 非球面表面既可以是旋转对称表面，也可以是旋转非对称表面和/或不规则表面，即，所有的表面不是球面。 The aspherical surface may be either a rotationally symmetric surface may be a rotationally asymmetric surface and / or irregular surfaces, i.e. all surfaces not spherical. 人们正在讨论这样的问题，即带有植入的眼内透镜（IOL)的眼睛其视力与同龄人的正常眼睛的视力是可比的。  people are discussing this issue, that is, with implantation of an intraocular lens (IOL) eyes of their peers with normal vision eye vision is comparable. 因此，一位70岁的白内障患者仅仅能够指望在进行眼内透镜植入手术后获得同龄无白内障的人的视力，尽管客观上认为这种透镜在光学上优于天然晶状体。 Therefore, a 70-year-old cataract patient can only expect to get the same age without the person's vision after cataract within the intraocular lens implant surgery is performed, although it is believed that the objective lens is superior to the natural crystalline lens in the optical. 这ー结论可通过下面的事实进行解释，目前的IOL不适于补偿人眼光学系统的与年龄有关的缺陷。 This ー conclusion can be explained by the fact that the current IOL is not suitable for age-related defect compensation of human eye systems. 人们已经在研究与年龄有关的眼缺陷，并且发现大于50岁的研究对象的衬比灵敏度明显下降。 It has been the age-related eye defects study, and the study found that lining is greater than the 50-year-old fell significantly higher than sensitivity. 这些结论似乎符合上述的讨论，因为对比灵敏度测试表明做过透镜植入白内障手术的人不会比平均年龄在60到70岁的人获得更好的衬比灵敏度。 These results seem consistent with the above discussion, because the contrast sensitivity tests show that cataract surgery done a lens implant will not in 60-70 years of age get a better contrast sensitivity than than the average age. 尽管已经开发出了具有优异光学性能的、g在取代有缺陷的白内障晶状体和诸如常规的隐形眼镜或眼内矫正透镜的其他眼科透镜的眼内透镜，但是很明显，它们未能对大量的眼像差现象、包括与年龄有关的像差缺陷进行矫正。  While there has been developed with excellent optical properties, g intraocular lens substituted defective cataract lens and other such as conventional contact lenses or intraocular correction lens is an ophthalmic lens, it is obvious that they fail to a large number of ocular aberrations phenomena, including age-related aberration defects corrected. 美国专利5，777，719 (Williams等）公开了ー种将人眼作为光学系统，利用波前分析来精确测量更高阶眼像差的方法和装置。  U.S. Patent No. 5,777,719 (Williams et al) discloses ー species as the human eye optical system, before the wave analysis using a method and apparatus for accurately measuring higher order aberrations of the eye. 通过使用哈脱曼-肖克（Hartmann-Shack)波前传感器，能測量眼的更高阶像差并用所获得的数据对这些像差进行矫正，并由此得到设计能够提供高度改良的光学矫正的光学透镜的足够信息。 By using Hartley Mann - Shocker (Hartmann-Shack) wavefront sensor, capable of measuring these aberrations corrected for higher order aberrations of the eye and the obtained data, and thereby obtaining highly improved design can provide optical correction sufficient information of the optical lens. Hartmann-Shack传感器提供了ー种用于获得从研究对象眼视网膜反射的光的装置。 Hartmann-Shack sensor provides means to obtain light reflected from the object of study for retinal ー species. 瞳孔平面内的波前在Hartmann-Shack传感器的小透镜阵列平面上重现。 Waves in the pupil plane of the front reproduced on the lenslet array plane Hartmann-Shack sensor. 小透镜阵列中的每个小透镜均用于在阵列焦平面处的CXD摄像机上形成视网膜点光源的空间图像。 Each lenslet in lenslet array are a space for forming an image of the retinal point source on the focal plane of the camera array CXD. 以由激光束在视网膜上产生点光源的形式，眼的波像差以正比于每个小透镜上波前的局部倾斜量位移每个光斑。 In the form of a point light source generated by the laser beam on the retina, the eye's wave aberration proportional to the local tilt displacement amount of the wavefront on each small lens of each spot. CXD摄像机的输出送入计算机，然后进行计算以使斜率数据符合65个查涅克（Zernike)多项式的ー阶导数。 CXD output of the camera into the computer, and then calculated so that the slope data are consistent with Zernike 65 (the Zernike) ー first derivative of the polynomial. 通过计算，可获得加权查涅克多项式的系数。 By calculation, obtained Zernike polynomial weighting coefficients. 被加权的查涅克多项式总和代表重建的波前，该波前由作为光学系统的眼的像差引起失真。 Zernike polynomials wave representing the sum of the weighted reconstructed before, the wavefront distortion caused by the aberration of the eye as an optical system. 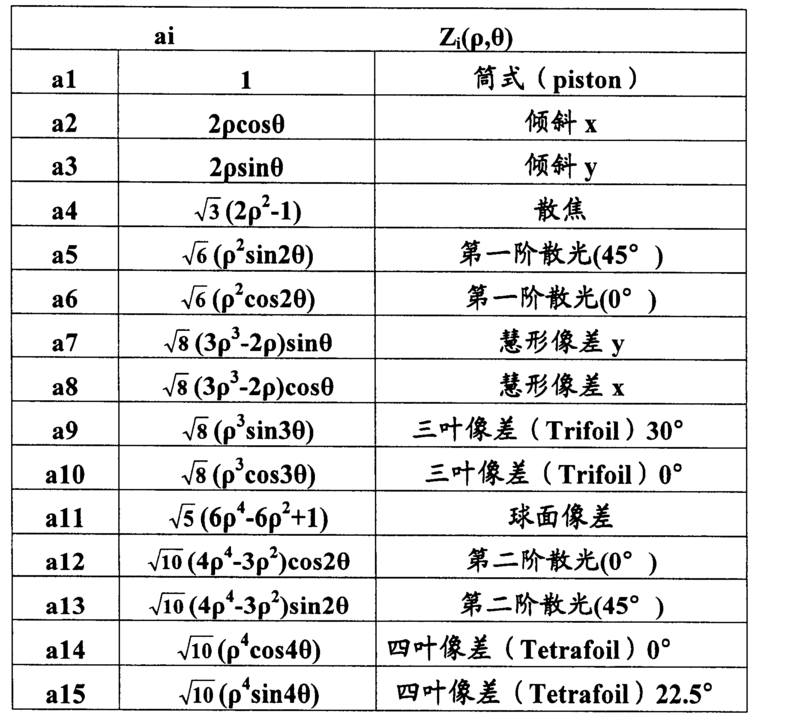 查涅克多项式的各项表示不同模式的像差。 Zernike polynomials represents aberrations of different modes. 美国专利5，050，981 (Roffman)公开了另一种设计透镜的方法,该方法是这样实现的：跟踪穿过透镜-眼系统的大量射线，然后根据这些射线计算其调制传递函数，并评价成像位置处射线的密度分布。  U.S. Patent No. 5,050,981 (Roffman) discloses another method for designing a lens, the method is implemented as follows: tracking through the lens - eye system a large number of rays, then calculate the modulation transfer function according to these rays and evaluated at the imaging position of the beam density distribution. 这ー过程通过改变至少ー个透镜表面而反复进行，直到发现一个透镜产生清晰的焦点和最小的成像像差。 This ー ー process by changing at least one surface of the lens is repeated until a lens is found to produce sharp focus and a minimum of image aberrations. 上述用于设计的方法适于为晶状体眼设计隐形眼镜或者其他矫正透镜，它能完美地补偿整个眼球系统的像差。  The method for designing ophthalmic lens design is suitable for contact lenses or other correction lenses, which can perfectly compensate the aberration of the whole eye system. 然而，为了提供适合放置在角膜和囊内晶状体之间、前房(anterior chamber)或后房（posterior chamber)中的改良的眼内透镜,贝U需要考虑眼各个部分的像差。 However, in order to provide a suitable place between the cornea and the capsular bag lens, improved anterior chamber (anterior chamber) or housing (posterior chamber) of the intraocular lens, the aberration of each shell portion U to be considered eye. 最近人们一直致力于对眼像差的研究，包括将像差的演变作为年龄函数的大量研究。  It has recently been working on eye aberrations, including a large number of research function of age will evolve as an aberration. 在一个特别的研究中，分别检测眼球各部分的成长情况，得到如下结论，较年轻眼球的各部分光学像差互相抵消，参见1998年出版的《Optical Letters》，第23 (21)卷第1713-1715 页。 In one particular study, the growth detect respective components of the eye, the following conclusions, each portion of the optical aberrations younger eyes cancel each other out, see, published in 1998, "Optical Letters", 23 (21) 1713 Vol. -1715 page. 还有，S. Patel 等人在1993 年出版的《Refractive&Corneal Surgery))第9卷第173-181页的论文中公开了角膜后表面的非球面性。 There, S. Patel et al., Published in 1993 "Refractive & Corneal Surgery)) Papers Vol. 9, pp. 173-181 disclosed the aspherical surface of the cornea. 该文建议可以将角膜数据与其他眼参数一起使用以预测眼内透镜的光学性能和非球面性，并由此使未来的人工晶状体眼的光学性能达到最佳。 The suggested above may be used with other ophthalmic corneal data to predict the optical performance parameters with the intraocular lens and asphericity, and thus the intraocular lens future optimal optical performance. 此外，最近Antonio Guirao和Pablo Artal发现并在1999年出版的《I0VS》第40(4)卷，S535中指出角膜的形状随年龄改变，变得更加呈球面形状。 In addition, the recent discovery Antonio Guirao and Pablo Artal pointed shape of the cornea and change with age and becomes more spherical shape in 1999 published "I0VS" section 40 (4) volumes, S535 in. 这些研究显示研究对象的角膜提供了正球面像差，并且随年龄而增长。 These studies show that corneal study provides a positive spherical aberration, and with age. 1998年出版的《视觉研究》的第38(2)卷第209-229页中，A Glasser等人研究了从眼库获得的角膜摘除之后的天然晶状体的球面像差。 Published in 1998, "Vision Research" section 38 (2) pp. 209-229 in, A Glasser, who studied the natural lens of the spherical aberration of the cornea obtained after removal from the eye bank. 按照这里使用的激光扫描光学方法，发现较年长的晶状体（66岁）的球面像差显示为未矫正的（正的)球面像差，而10岁的晶状体显示过矫正的（负的)球面像差。 According to a laser scanning optical method used herein, we found older lens (66 years old) show the spherical aberration of the uncorrected (positive) spherical aberration, whereas a 10-year-old display overcorrected lens (negative) spherical aberration. 鉴于前文，显然，需要一种眼科透镜，它能更好地适用于补偿眼球各表面（如角膜表面和囊内晶状体的表面）产生的像差，以及能更好地矫正除散焦和散光之外的像差，正如传统眼科透镜所能提供的那样。  In view of the foregoing, clearly a need for an ophthalmic lens, it is better suited for each surface aberration compensation of the eye (e.g. corneal surface and capsular bag lens surface) is generated, and in addition better corrected defocus aberration and astigmatism other than as a conventional ophthalmic lens can provide that. 本发明的一个目的是提高眼睛的视觉质量。  An object of the present invention is to improve the visual quality of eyes. 本发明的另一目的是提供获得一种眼内透镜的方法，该眼内透镜能够在眼中植入后减少眼的像差。  Another object of the present invention is to provide an intraocular lens to obtain a method of the intraocular lens capable of reducing aberrations of the eye in the eye after implantation. 本发明进一步的目的是提供获得眼内透镜的方法，该眼内透镜能够补偿由于角膜表面和囊内晶状体表面的光学不规则性而产生的像差。 A further object of the  present invention is to provide a method for obtaining the intraocular lens, the intraocular lens capable of compensating the aberration due to optical irregularities in the corneal surfaces and the capsular bag lens surface generated. 本发明进一步的目的是提供一种眼内透镜，其中该眼内透镜与囊中的晶状体一起能将偏离球形的波前恢复为充分接近球形的波前。 A further object of the  present invention is to provide an intraocular lens, the intraocular lens wherein the lens capsule can deviate from the spherical wave front recovery is sufficiently close to a spherical wavefront together. 本发明进一步的目的是提供一种眼内透镜，它能为做过角膜手术的患者或具有角膜缺陷或疾病的患者提高视觉质量。 A further object of the  present invention is to provide an intraocular lens, it is done or corneal surgery patients having corneal defects or to improve the visual quality of the patient's disease. 本发明一般涉及获得一种眼科透镜的方法，该眼科透镜能减少眼的像差。  The present invention generally relates to a method for obtaining an ophthalmic lens, the ophthalmic lens to reduce the aberration of the eye. 这里的像差指的是波前像差。 Herein it refers aberration wavefront aberrations. 它基于下述理解，会聚的波前必须完全是球面以形成一个点像，即，如果要在眼球视网膜上形成完美的图像，那么通过眼球的光学表面的波前，如通过角膜和自然晶状体的波前，必须完全是球面的。 It is based on the understanding that a converging wavefront must be completely spherical to form a point image, i.e. if a perfect image to be formed on the retina of the eye, the surface of the optical wave front by the eye, such as through the cornea and the natural lens wavefront, must be completely spherical. 如果波前偏离球面，则形成有像差的图像，这是在图像通过非完美透镜系统时出现的情况。 If the deviation from a spherical wave front, there is formed an image aberration, which is the situation when the image through a non-perfect lens system. 波前像差可依据不同的近似模型以数学术语表示，如参考书中解释的那样，例如MR Freeman在1990年出版的第10版《光学》中所记载的。 Wavefront aberration can be expressed in mathematical terms based on different approximate models, as explained in reference books such as MR Freeman in 1990, published 10th edition "optical" in the claims. 建立眼内矫正透镜模型，使得包括所述眼内矫正透镜以及所述角膜和所述囊内晶状体的数学模型的光学系统产生的波前获得减少的像差。  establishing the intraocular correction lens model, such that an optical system comprising correction lens and the mathematical models of the cornea and the capsular bag lens of the eye is generated in the wave front aberration reduction obtained. 在第一个实施方案中，本发明涉及一种眼内透镜的设计方法，该眼内透镜在眼内植入后能够减少眼的像差。  In a first embodiment, the present invention relates to a method of designing an intraocular lens, the intraocular lens within the eye after implantation in the eye can be reduced aberrations. 所述方法包括第一步，利用波前传感器测量未矫正眼的波前像差。 The method comprises a first step, using a wavefront sensor for measuring the uncorrected eye wavefront aberration. 并利用角膜地形仪测量眼内至少一个角膜表面的形状。 And using a corneal topographer corneal surface shape of at least intraocular measurements. 将该至少一个角膜表面和包括该角膜的眼的囊内晶状体用数学模型表征，并利用该数学模型来计算角膜表面和囊内晶状体的最终像差。 The at least one corneal surface and the eye comprising the cornea of ​​the capsular bag lens with mathematical models characterizing, and using the mathematical model to calculate the final aberration of the corneal surface and capsular bag lens. 囊内晶状体可以是自然晶状体或者任何种类的植入晶状体。 The natural lens capsular bag lens can be implanted or any kind of lens. 在下文中，囊内的晶状体被称为囊内晶状体。 Hereinafter, the capsular bag lens is called the capsular bag lens. 由此得到角膜和囊内晶状体的像差的表述，即，穿过该角膜表面和该晶状体的波前的波前像差。 Whereby expression of the cornea and capsular bag lens aberrations, i.e., through the wavefront aberration of the wave front surface of the cornea and the lens. 根据选定的数学模型，可经不同途径计算像差。 The mathematical model selected, the aberration may be calculated by different routes. 优选地，角膜表面和囊内晶状体的特征以旋转二次曲面或者多项式或者两者相结合的数学模型表示。 Wherein preferably, the corneal surface and the capsular bag lens quadric of revolution represented by a mathematical model or a polynomial, or a combination of both. 更优选地，角膜表面和囊内晶状体的特征以多项式的线性组合表示。 Characterized More preferably, the corneal surface and the capsular bag lens are expressed in linear combinations of polynomials. 方法的第二步为选择眼内矫正透镜的屈光度，这一步骤依照对于眼球进行光学矫正的特定需要而采用的常规方法来完成。 The second step of the method for the selection of diopter intraocular correction lens, in accordance with conventional methods of this particular step is required for optical correction of the eye to complete employed. 按照步骤一和二的信息来建立眼内矫正透镜的模型，使包括所述矫正透镜以及角膜和囊内晶状体的数学模型的光学系统的波前获得减小的像差。 The information of steps one and two modeled intraocular correction lens, so as to obtain a reduced aberration wave optical system comprising said correction lens and the mathematical models of the cornea and the capsular bag lens front. 在建立透镜模型时，被考虑的光学系统通常包括角膜、囊内晶状体和所述矫正透镜，但是在特定情况下，也可以包括其它光学元件，根据具体情况包括眼科透镜，或者人工矫正镜，如隐形眼镜，或者可植入的矫正透镜。 When the lens model is established, the optical system under consideration typically comprises a cornea, the capsular bag lens and said correction lens, but in certain cases, may also include other optical elements, as the case comprises an ophthalmic lens, or an artificial correction lens, such as contact lenses, or an implantable correction lens. 给透镜建立模型包括选择系统中的一个或几个有助于确定给定屈光度的透镜形状的透镜参数。  Create a model comprising a lens system is selected to help determine or several lens parameters of the lens shape of a given refractive power. 这通常包括选择前端半径及前表面形状、后端半径及后表面形状、透镜厚度、透镜折射率，以及透镜在眼中的位置。 This typically includes selecting the front tip radius and surface shape, the radius of the rear end and the rear surface shape, the lens thickness, the refractive index of the lens, and the position of the lens in the eye. 实际上，给透镜建立模型可基于一种矫正透镜的数据来进行，这种矫正透镜在申请号为SE-0000611-4的瑞典专利申请中有记载，该文在这里引入本文作为参考。 Indeed, a lens may be based on the data model and an antidote to the lens, this correction lens is described in Swedish Patent Application No. SE-0000611-4, the text of which is incorporated herein by reference herein. 在此情况下，最好选择与已经临床确定的模型偏离尽可能小的模型。 In this case, the best choice for the model have been clinically determined model deviates as little as possible. 为此，最好保持透镜中心半径、厚度以及折射率的预定值不变，同时选择不同形状的前表面或后表面，从而使透镜的表面是非球面或非对称形状的表面。 For this reason, it is preferable to maintain the center of the lens radius, a thickness and a predetermined constant value refractive index, while selecting a different shape of the front surface or back surface so that the surface is an aspherical surface lens or asymmetric shape. 本发明的另一种方法是通过选择适当的非球面部分来给常规的初始透镜的球形前表面建立模型。 Another method of the present invention to the front surface of the model to a conventional spherical lens by selecting an appropriate initial aspheric part. 透镜的非球面设计是众所周知的技术，这种设计可依照不同的原理实现。 Aspherical lens design technology is well known, this design can be achieved according to different principles. 有关这种表面的构造在本申请人的与本申请同时待审的瑞典专利申请0000611-4中有更详细地说明，可供参考。 For this configuration the surface of the Swedish patent 0000611-4 there is present in the co-pending application of the present Applicant described in more detail, by reference. 如上文所述，术语“非球面”并不限于对称表面。 As described above, the term "aspherical surface" is not limited to the symmetrical surface. 例如径向非对称透镜可用于校正慧差。 For example radially asymmetric lenses can be used to correct coma. 通过将包括角膜和囊内晶状体的数学模型以及矫正透镜光学系统的像差与角膜和囊内晶状体的像差进行比较，并且评定是否充分减少了像差，能进一步地发展本发明的方法。  By including mathematical models of the cornea and the capsular bag lens and the correction lens of the optical system and aberrations of the cornea and the capsular bag lens aberrations are compared, and assess whether the aberration is sufficiently reduced, to further development of the invention method. 从透镜的上述物理参数中可得到适当的可变参数，改变这些参数可以找到一种透镜模型，它能充分偏离球面透镜以补偿像差。 Physical parameters obtained from the appropriate variable lens parameters, these parameters can be changed to find a lens model, which can fully compensate for deviation from the spherical aberration of lenses. 并且将其用像差项表征和表达，如代表总角膜像差的多项式线性组合。 And which was characterized and expressed aberration terms, such as a linear combination of polynomial representative of the total corneal aberrations. 根据本发明的一个重要方面，在选定人群中实施角膜和囊内晶状体的表征，以表示像差的平均值并根据该平均像差设计透镜。 According to an important aspect of the present invention, characterization of the cornea and the capsular bag lens population in selected embodiments, to indicate the average of aberrations and designing a lens aberration based on the average. 然后可计算人群的平均像差项，例如作为多项式的平均线性组合，并将上述像差项用于透镜设计方法中。 Then calculate the average aberration terms of the population, for example as an average linear combination of polynomials and used in the above-described lens aberration term designing process. 这一方面包括选择不同的相关人群，例如以年龄分组，从而产生符合各设计方法的合适的平均角膜表面和囊内晶状体。 This aspect includes selecting different relevant populations, for example in age groups, to generate suitable average corneal surfaces and capsular bag lens of each line with the design method. 这样，患者将获得一种与基本上呈球面的常规透镜相比具有更小像差的透镜。 Thus, patients will obtain a conventional lens having substantially spherical lens aberration is smaller compared. 优选地，上面提到的测量也包括测量眼的折射屈光度。  Preferably, the above-mentioned measurements also include the measurement of the eye refractive power. 在本发明的设计方法中，为了选择透镜的屈光度，通常考虑角膜和囊内晶状体的屈光度以及眼球的轴向长度。 In the design method of the present invention, in order to select the lens refractive power, axial length normally considered capsular bag lens and the cornea of ​​the eyeball and refraction. 同样优选地，这里波前像差被表示为多项式的线性组合，并且包括角膜和囊内晶状体的数学模型以及模型化的眼内矫正透镜的光学系统提供像差如由一个或多个这样的多项式的项所表示的显著减小的波前，在光学领域，技术人员可用几种多项式的项描述像差。  Also preferably, the wavefront aberrations herein are expressed as a linear combination of polynomials and the optical system comprising the mathematical models of the cornea and the capsular bag lens and intraocular correction lens is modeled, such as provided by one or more aberrations wave significantly reduced such polynomial represented before, in the optical field, aberration of the art available items described several polynomials. 多项式以赛德尔（Seidel)或者查涅克多项式为好。 Polynomials Seidel (Seidel) or Zernike polynomials as well. 根据本发明优选查涅克多项式。 According to the present invention Zernike polynomials preferably. 使用查涅克项对偏离无像差的光学表面所产生的波前像差进行描述是最新技术，并且可以和例如Hartmann-Shack传感器一起使用，如1994年出版的《J. Opt. Soc. Am.》第11(7)卷第1949-57页所概括的。  using the wavefront aberration terms of the Zernike aberrations without departing from the generated optical surfaces is the latest technology will be described, and may be used together with e.g. Hartmann-Shack sensor, as published in 1994, "J. Opt. Soc. Am. "11 (7) pp. 1949-57 outlined. 在光学专业人员中广泛得到认可的是，不同的查涅克项表示不同的像差现象，包括散焦，散光，慧差，球面像差以及更高阶形式的像差。 Widely recognized in the optical professionals, the different Zernike terms represent different aberration phenomena including defocus, astigmatism, coma, spherical aberration and higher order aberrations form. 在本方法的一个实施方案中，角膜表面和囊内晶状体的测量导致角膜表面形状和囊内晶状体形状可被表示为查涅克多项式的线性组合（如方程式（I)所示），其中Zi为第i个查涅克项，ai为该项的加权系数。 In one embodiment of the present method, the corneal surface and capsular bag lens measurements results in a corneal surface shape and a capsular bag lens shape can be expressed as a linear combination of Zernike polynomials (as in Equation (I) below), wherein Zi is the i-th Zernike term, ai is the weighting coefficient of. 查涅克多项式是定义在单位圆上一组完全正交的多项式。 Zernike circle polynomials defined over a set of complete orthogonal polynomials in a unit. 下面，表I示出了最先的15个查涅克项，以及每项表示的像差，这些项可达第四阶。 The following Table I shows the first 15 Zernike terms and the aberrations each represented by these terms up to the fourth order. 利用眼内透镜的传统光学矫正仅仅满足包括已植入透镜的眼球的光学系统的第四项。  With the conventional intraocular lens includes a fourth optical correction only meet the implanted eye lens optical system. 可对散光进行矫正的眼镜，隐形眼镜以及眼内透镜，能进一步满足第五项和第六项，因此显著减少涉及散光的查涅克多项式。 Glasses for astigmatism can be corrected, contact lenses and intraocular lenses, and further satisfy the fifth sixth, thus significantly reducing Zernike polynomial relates astigmatism. 本发明的方法进一步包括计算包含模型化的眼内矫正透镜以及所述角膜和囊内晶状体的数学模型的光学系统产生的、以多项式的线性组合形式表示的像差，并确定眼内矫正透镜是否充分地减少了像差。  The present invention further comprises a method of calculating an optical system comprising the modeled intraocular correction lens and the mathematical models of the cornea and the capsular bag lens generated aberration represents a linear combination of polynomials and to determine the intraocular whether correction lens sufficiently reduces the aberrations. 如果像差减少得不够充分，那么将对透镜重新模型化，直到多项式的一项或几项充分减小。 If aberration reduction was not sufficient, then the lens will be re-modeled until one or several of the polynomial sufficiently reduced. 对透镜重新模型化意味着改变至少一个常规透镜设计参数。 Re-modeling of the lens means changing at least one conventional lens design parameters. 这些参数包括前表面形状和/或中心半径，后表面形状和/或中心半径，透镜厚度及其折射率。 These parameters include the shape of the front surface and / or central radius, the surface shape and / or central radius, lens thickness and refractive index. 通常，这样的重新模型化包括改变透镜表面的曲率，以使其偏离精确的球面。 Typically, such re-modeling includes changing the curvature of the lens surface, so as to deviate from a precise spherical. 在透镜设计方面有几种可用的工具，可用于本设计方法中，如OSLO第5版，参见1996年出版的((Sinclair Optics))第4 章〈〈ProgramReference〉〉。 There are several tools available in lens design, can be used in the present design method, such as OSLO version 5 see published in 1996 ((Sinclair Optics)) Chapter 4 << ProgramReference >>. 根据第一实施方案的首选方面，本发明的方法包括将至少一个角膜表面和囊内晶状体的形状表示为查涅克多项式的线性组合，并由此确定角膜和囊内晶状体的波前的查涅克系数，即，所选定的每个查涅克多项式的系数。  According to a first aspect of the preferred embodiment, the method of the present invention comprises at least one corneal surface shape and a capsular bag lens as a linear combination of Zernike polynomials and thereby determining the corneal and capsular bag lens wave front Zernike coefficients, i.e., the selected Zernike coefficients for each polynomial. 然后对矫正透镜建立模型，从而使包括所述模型化的矫正透镜以及角膜和囊内晶状体的数学模型的光学系统提供一个所选定查涅克系数充分减小的波前。 Then model for corrective lenses, so that the optical system comprising said model lens and the correction of the mathematical models of the cornea and the capsular bag lens provides a sufficient reduction of the Zernike coefficients of the wavefront selected. 通过下述步骤可以进一步改进本方法：计算代表由包括模型化的眼内矫正透镜以及角膜和囊内晶状体的数学模型的光学系统产生的波前的查涅克多项式的查涅克系数，确定透镜是否为角膜和囊内晶状体的波前提供充分减小的查涅克系数；并可对透镜重新模型化，直到所述系数充分减小。 The present method can be further improved by the following steps: Zernike coefficients of the Zernike polynomials of the wavefront generated by the calculation representative of the optical system comprising correction lens and the mathematical models of the cornea and the capsular bag lens of the eye model to determine the lens whether for the wave front of the capsular bag lens and the cornea sufficiently reducing Zernike coefficients; and lens re-modeled until the coefficients are sufficiently reduced. 本方法的该方面宜考虑查涅克多项式可达第四阶，并且其目的是充分减小涉及球面像差和/或散光项的查涅克系数。 This aspect of the process should be considered Zernike polynomials up to fourth order and an object thereof is to sufficiently reduce Zernike coefficients relates to spherical aberration and / or astigmatism terms. 最好是充分减小由包括角膜和囊内晶状体的数学模型及所述模型化的眼内矫正透镜的光学系统产生的波前的第11个查涅克系数，从而可获得充分消除球面像差的眼球。 Preferably sufficiently reduce the 11th Zernike coefficient of a wavefront resulting from an optical system comprising the mathematical models of the cornea and the capsular bag lens and said modeled intraocular correction lens, so as to eliminate spherical aberration is sufficiently obtained eye. 本设计方法的另一方案可以包括减少更高阶像差，由此本方法的目标为减少比第四阶更高阶的像差项的查涅克系数。 Another embodiment of the design method may include reducing higher order aberrations, whereby the object of the present method is to reduce the ratio of the fourth order Zernike coefficients of higher order aberration terms. 以选定人群的角膜和囊内晶状体的表性为基础设计透镜时，每个人的角膜表面和囊内晶状体最好都被表示在查涅克多项式中，由此确定查涅克系数。 When  In selected populations corneal and capsular bag lens tables designed on the basis of the lens, each of the corneal surface and capsular bag lens preferably are expressed in Zernike polynomials, thereby determining the Zernike coefficients . 根据这些结果，计算平均查涅克系数并将其应用于设计方法中，以充分减小选定系数。 From these results average Zernike coefficients calculated and applied to the design process, to substantially reduce the selected coefficient. 需要指出的是，以一大群人的平均值为基础的设计方法所得到的最终透镜，具有为所有使用者显著提高视觉质量的目的。 It should be noted that the average value of the final lens to a large group of people based design method is obtained, for the purpose of having all users significantly improved visual quality. 作为其结果，基于平均值而完全消除像差项的透镜对具体某个个体可能是不适用的，导致其视力会比戴常规眼科透镜差。 As a result, based on the average and completely eliminate lens aberration terms of a specific individual may not be applicable, resulting vision will be worse than the conventional ophthalmic lens wear. 为此，可适当地将选定的查涅克系数比平均值减少一定的程度或预定的比例。 For this purpose, it may be appropriately selected Zernike coefficient than the average value of a certain level or a predetermined reduction ratio. 根据发明设计方法的另一方面，可以在系数值方面比较选定人群的角膜和囊内晶状体的表征及其产生的表示每个人角膜和囊内晶状体的像差的多项式，例如查涅克多项式，的最终线性组合。 Polynomial representation  According to another aspect of the inventive design method, corneal and capsular bag lens can be characterized by comparing the selected population and the resulting coefficient values ​​in every aspect of human corneal and capsular bag lens aberrations, e.g. check nie the polynomial g, the final linear combination. 根据这一结果，为适当的透镜选择适当的系数值，并用于发明的设计方法中。 According to the result, select the appropriate coefficient values ​​for the appropriate lens, and a design method of the invention. 像差具有相同符号的选定人群中，这样一个系数值通常可能是选定人群中的最低值，因此根据此值设计的透镜与传统透镜相比可为组中的所有人提供改良的视觉质量。 Selected populations of aberrations of the same sign such a coefficient value can often be the lowest value within the selected population, so this value according to the lens design and can provide improved compared to conventional lens group for all the visual quality . 根据另一实施方式，本发明针对从许多具有相同屈光度但是不同像差的透镜中选择折光屈光度适于患者光学矫正所需要的眼内透镜。  According to another embodiment, the present invention is directed to it from a number of the intraocular lens with the same dioptric power lenses of different diopter refractive aberrations adapted to select the desired optical correction patient. 这种选择方法类似地根据在本发明方法中所描述的设计方法而实施，并且包括利用数学模型对至少一个角膜表面和囊内晶状体进行表征，并据此计算角膜表面和囊内晶状体的像差。 This selection method analogous design method according to the present invention, the method described in the embodiments, and includes at least one mathematical model of the corneal surface and capsular bag lens characterization, and calculate the corneal surface and capsular bag lens aberrations . 然后评估包括已选矫正透镜以及角膜和囊内晶状体的数学模型的光学系统，从而考虑通过计算这样一个系统得到的波前像差是否实现了像差的充分减少。 Then the selected evaluation comprises an optical system and a correction lens and the mathematical models of the capsular bag lens of the cornea, to account for such a system is obtained by calculating the wavefront aberration achieved if sufficient reduction in aberrations. 如果发现矫正不充分，则选择具有相同屈光度但是不同像差的另一个透镜。 If it is found insufficient correction is selected to have the same power, but different aberrations other lens. 这里所用的数学模型与上面所述的那些相似，并且可以使用同样的角膜表面和囊内晶状体的表征方法。 Mathematical models similar to those used herein and above, and the same method can be used to characterize the corneal surface and the capsular bag lens. 优选地，这种选择确定的像差表示为查涅克多项式的线性组合，并计算所得到的包括角膜和囊内晶状体的数学模型以及选定矫正透镜的光学系统的查涅克系数。  Preferably, this selection is determined aberrations as a linear combination of Zernike polynomials, Zernike coefficients and mathematical models including the cornea and the capsular bag lens as well as values ​​calculated by the optical system of the selected correction lens . 从系统的系数值能够确定该眼内矫正透镜是否充分地平衡了角膜和囊内晶状体的像差项，如光学系统的查涅克系数所述的那样。 From the coefficient values ​​of the system can determine if the intraocular correction lens sufficiently balanced the corneal and capsular bag lens aberration terms, such as Zernike coefficients of the optical system of the above. 如果发现预期的各个系数没有充分减小，则通过选择具有相同屈光度、不同像差的另一个矫正透镜而重复这些步骤，直到发现一个能够有效地减少光学系统的像差的透镜。 If desired individual coefficients found not sufficiently reduced, by selecting the same power, another aberration correction lens different and repeating these steps until a found effective to reduce lens aberrations of the optical system. 优选地，至少确定15项查涅克多项，达第4阶。 Preferably at least 15 Zernike determined number, up to the 4th order. 如果认为有效地矫正了球面像差，那么仅仅对包括角膜和囊内晶状体以及眼内矫正透镜的光学系统的查涅克多项式的球面像差项进行校正。 If valid corrected spherical aberration, only the spherical aberration terms then Zernike polynomial includes an optical system of cornea and capsular bag lens and intraocular correction lens are corrected. 需指出的是，应选择眼内矫正透镜，使得对于包括矫正透镜以及角膜和囊内晶状体的光学系统的那些项的选择变得足够小。 To be noted that the intraocular correction lens shall be selected so that the selection item of the optical system comprising correction lens and cornea and capsular bag lens becomes sufficiently small. 依照本发明，能够基本消除第十一个查涅克系数，an，或者使其充分接近O。 According to the present invention, it is possible to substantially eliminate an eleventh Zernike coefficients, an, or sufficiently close O. 这是获得充分减少眼球球面像差的眼内矫正透镜所必备的前提。 This is to obtain sufficient reduction of the spherical aberration of the eyeball corrected intraocular lens prerequisite to. 通过以同样的方式考虑其他查涅克系数，本发明的方法能够用于校正除球面像差之外的其他类型的像差，例如那些代表散光，慧差和更高阶的像差的系数。 In the same way by considering other Zernike coefficients, the method of the present invention can be used to correct other types of aberrations other than the spherical aberration, for example, those representing astigmatism, coma and higher order coefficients of aberration. 根据选作为模型一部分的查涅克多项式的数量，还可以校正更高阶的像差，这种情况下，可以选择能校正比第四阶更高阶的像差的矫正透镜。 The number of Zernike polynomials selected as part of the model, can also correct higher order aberrations, in this case, can be selected capable of correcting higher order than fourth order aberration correction lens. 本发明的设计眼内矫正透镜的方法包括将所述角膜表面和所述囊内晶状体用多项式或多项式的线性组合表征，包括建立眼内矫正透镜的模型，使得该光学系统提供减小的赛德尔或查涅克多项式表示的穿过该系统的波前的球面及柱面像差项。  The design of the intraocular lens of the present invention comprises a method of correcting the corneal surface and the capsular bag lens polynomial or a linear combination of polynomials characterized by including modeling the intraocular correction lens such that the optical system provides reduction of cylindrical and spherical wavefront aberration term of the system through Seidel or Zernike polynomial representation. -建立一个矫正透镜模型，使得包括矫正透镜以及囊内晶状体和角膜的多项式模型光学系统产生的波前充分地减小所述标称系数值。  - establishing a corrective lens model, so that sufficiently reducing the nominal coefficient values ​​include corrective lens and the capsular bag lens and the polynomial models wave optical system before generating the cornea. 根据一个重要方面，本选择方法包括从成套矫正透镜中选择矫正透镜，所述成套矫正透镜具有一定的屈光度范围，并且每个屈光度的多个矫正透镜具有不同的像差。  In accordance with one important aspect, the selection method comprises selecting from a kit of correction lenses corrective lens, a corrective lens sets having a certain diopter range, and each of a plurality of refraction correction lenses having different aberrations. 在一个实施例中，每个屈光度的多个矫正透镜含有不同非球面部分的前表面。 In one embodiment, each of the plurality of diopter correction lens comprising an aspherical front surfaces of different portions. 如果第一个矫正透镜不能显示充分地减少了像差，正如表示在适当的查涅克系数中的，那么选择具有相同屈光度但是不同表面的另一个矫正透镜。 If a first correction lens does not exhibit sufficient reduction of aberration, as expressed in suitable Zernike coefficients, then further selected to have the same power but different correction lens surface. 如果需要的话，该选择方法可反复进行直到发现最佳矫正透镜或者所研究的像差项降低到有效边界值以下。 If desired, the selection method can be repeated until the best correction lens is found or decrease the studied aberration terms valid boundary value. 实际上，通过角膜和囊内晶状体检测获得的查涅克项将由眼科医生直接得到，借助于算法它们将与成套矫正透镜的已知查涅克项进行比较。 Indeed, obtained through the cornea and the capsular bag lens detected by an ophthalmologist Zernike terms obtained directly by means of the algorithm they will be compared to known Zernike terms of the correction lenses kit. 通过比较可找出整套中最合适的矫正透镜，并将其植入。 By comparison may identify the package of the most suitable correction lens, and implanted. 本发明进一步涉及一种具有至少一个非球面表面的眼内矫正透镜，它能够将穿过眼球角膜的波前转换为一种波前，该波前在穿过矫正透镜之后又穿过囊内晶状体时转换为基本上呈球形且其中心位于眼球视网膜上的波前。  The present invention further relates after intraocular correction lens having at least one aspherical surface, which can be converted into a wave front passing through the wave front of the cornea of ​​the eye, the wavefront passing through the correction lens and through conversion lens capsule is substantially spherical and the front wave on its center at the retina of the eye. 优选地，相应于表示在旋转对称查涅克项的像差项达到第四阶时的像差项，该波前基本上是球形的。 Preferably, corresponding to aberration terms expressed in rotationally symmetric aberration terms while Zernike terms of fourth order reaches, the wavefront is substantially spherical. 依照本发明特别优选的实施方案，本发明涉及一种眼内矫正透镜，当像差被计算并表示为查涅克多项式项的线性组合时，该透镜的第四阶的第11项（即查涅克系数an)能在植入矫正透镜后基本上减少穿过眼球的波前的球面像差。  In accordance with the present invention, particularly preferred embodiment, the present invention relates to an intraocular correction lens, when the aberration is calculated and expressed as a linear combination of Zernike polynomial terms, item 11 of the fourth order of the lens (i.e. Zernike coefficient an) can substantially reduce spherical aberration of the wavefront passing through the eye after implantation corrective lens. 在该实施方案的一个方面，确定矫正透镜的查涅克系数an，从而补偿由足够数量的角膜和囊内晶状体查涅克系数an估计值产生的平均值。 In one aspect of this embodiment, the correction lens is determined Zernike coefficient an, amount sufficient to compensate for the corneal and capsular bag lens average Zernike coefficient estimates produced an. 在另一方面，确定查涅克系数an以补偿某个个体患者的角膜和囊内晶状体的系数。 In another aspect, the Zernike coefficient an is determined to cornea and capsular bag lens coefficient of compensating an individual patient. 因此能够为个体定制高精度的透镜。 With high accuracy can be customized for the individual lens. 根据本发明的透镜能以传统方法生产。  In the conventional method can produce a lens according to the present invention. 在一个实施例中，它们由软的，弹性材料，如硅氧烷酮或者水凝胶制成。 In one embodiment thereof, made of a soft, elastic material, silicone hydrogel or a ketone. 这种材料的例子记载在W098/17205中。 Examples of such materials are described in W098 / 17205. 非球面硅氧烷酮透镜或者类似地可折透镜的制造可根据美国专利6，007, 747实现。 One aspheric silicone lenses or similarly foldable lenses can be manufactured according to U.S. Patent No. 6,007 implemented, 747. 根据本发明的透镜也可以由更硬质的材料，诸如聚（甲基）丙烯酸甲酯制成。 The lens of the present invention may be formed of a more rigid material, poly (meth) acrylates such as methyl made. 本领域的技术人员能够很容易地确定可选的材料及制造方法，以生产本发明的减少像差的透镜。 Those skilled in the art can easily determine an alternative materials and manufacturing methods to produce lens of the present invention to reduce aberrations. 本发明的优选实施方案中，眼内矫正透镜适于植入虹膜和囊内晶状体之间的眼的后房中。  The preferred embodiment of the present invention, the intraocular correction lens adapted for implantation into the posterior chamber of the eye between the iris and the capsular bag lens. 根据该实施方案的矫正透镜优选地包括能提供光学矫正的位于中心的光学部分，和位于边缘的能够使所述光学部分保持在所述中心位置的支撑元件，所述光学部分和所述支撑元件均具有构成非球面的一部分的凹形后表面。 Comprising providing an optical correction based on the correction lens of the preferred embodiment in the center of the optical portion, and at the edge of the optical portion capable of holding the support member in the center position, the optical portion and the support member constituting each having a concave portion of a rear surface of the aspheric. 所述非球面与任何一个包括光轴的平面之间的交线代表没有间断和变形点的完美曲线。 The aspheric perfect curve without discontinuities representative of any of a line of intersection between a plane including the optical axis and the point of deformation. 这样一种不具有本发明减小像差的眼内矫正透镜在SE-0000611-4中有记载。 Such an intraocular correction lens having no aberration is reduced in the present invention are described in SE-0000611-4. 由于其适于眼球的解剖学结构，并避免对晶状体的压力，因而这种透镜设计是优选的。 Because of the anatomy of the eye which is adapted, and to avoid pressure on the lens, so this lens design is preferred. 由于这种设计，可避免自然晶状体和虹膜之间的接触，或将其降为最小。 Because of this design can avoid the contact between the iris and the natural lens, or reduced to a minimum. -选择一个没有变形点的完美曲线，该曲线代表后表面和包括光轴的平面的交叉线，从而提供矫正透镜表面的非球形后表面。  - selecting a perfect curve without inflection point, the curve representing the surface and intersecting the line plane including the optical axis, thereby providing a correction lens rear surface aspherical surface. 本发明矫正透镜适于植入到眼的前房内和/或固定于虹膜上。  The correction lens of the present invention is suitable for implantation into the anterior chamber of the eye or on and / or secured to the iris. 本发明的另一个实施例中，矫正透镜适合放置于眼的前房，并固定于虹膜上。 Another  embodiment of the present invention, corrective lenses adapted to be placed in the anterior chamber of the eye, and is fixed to the iris. 该实施例的优点在于矫正透镜附着于虹膜上，不能四处移动，也不能转动，因而使其更适于矫正非对称像差。 The advantage of an embodiment is that the correction lens is attached to the iris, can not move around, can not be rotated, thus making it more suitable for correcting non-symmetric aberrations. 本发明也涉及一种提高眼睛视力的方法。  The present invention also relates to a method of improving vision of an eye. 根据本发明将上述眼内矫正透镜植入眼中。 According to the invention the intraocular correction lens within the above-implanted in the eye. 也可以通过在眼球之外佩戴眼镜或者矫正眼镜，或者通过使用例如激光调整角膜从而进一步提闻视力。 It can also be worn outside the eye glasses or corrective lenses, or by using, for example, laser trimming of the cornea so that vision is further improved smell. 根据本发明的眼科透镜特别适于为了矫正角膜手术，如LASIC (激光角膜磨削术）和PRK(放射状角膜切开术），引起的像差而设计和制造。  The design and manufacture of ophthalmic lenses of the present invention is particularly suitable for corneal surgery to correct aberrations, such as LASIC (laser keratomileusis) and PRK (radial keratotomy), induced. 如上所述对做过角膜手术的患者的角膜和整个眼球进行测量，并根据这些测量值设计矫正透镜。 As described above the cornea and the whole eye corneal surgery patients did measured, and these measurements corrective lens design. 根据本发明的透镜也适于为具有角膜缺陷或角膜疾病的患者而设计。 Also suitable for having corneal defects or corneal diseases according to the lens design of the present invention. 根据本发明描述的透镜即可以为每个人单独设计也可以为一群人设计。  The lens described in this invention can be designed for each individual person can also be designed as a group of people. 本发明也涉及一种改良眼球视觉质量的方法，其中首先对眼实施角膜手术。  The present invention also relates to a method for improving the visual quality of the eye, wherein the eye is first embodiment corneal surgery. 然后在角膜得到恢复以后进行眼的波前分析。 Then wave after the cornea of ​​the eye is restored prior to analysis. 如果必须减少眼的像差，那么根据上述描述设计适合于这个人的矫正透镜。 If necessary to reduce the aberration of the eye, the design is adapted to the person's correction lens in accordance with the above description. 然后将这种矫正透镜植入眼内。 This correction lens is then implanted in the eye. 不同类型的角膜手术都可以。 Different types of corneal surgery can be. 两种通常的方法是LASIK和PRK,如JJ Rowsey等人于1998年出版的《Survey ofOphthalmology》第43(2)卷,第147-156页所记载的。 Two common methods are LASIK and PRK, as JJ Rowsey et al, published in 1998 "Survey ofOphthalmology" 43 (2), pp. 147-156 described. 本发明的方法具有特别的优点，做过角膜手术并具有明显视觉缺陷的人可以获得完美的视觉质量。 The method of the present invention who has the particular advantage, and corneal surgery did have significant visual defects perfect visual quality can be obtained. 这是利用传统手术是难以达到的。 This is the use of traditional surgery is difficult to achieve. 1. ー种眼内透镜，包括：为植入治疗对象眼中而构造成的光学部分；和至少ー种非球面表面，当其像差表示为多项式项的线性组合时，其与眼的囊内晶状体结合，能够减小穿过角膜的波前得到的类似的这种像差项，其中所述眼内透镜放置在角膜和囊内晶状体之间、前房或后房中。 1. ー species intraocular lenses, comprising: treating the eye to be implanted into the object optical portion configured; ー species and at least an aspherical surface, the aberration is represented as a linear combination of polynomial terms, its capsule of the eye binding the lens, can be reduced through similar such aberration terms obtained in the wave front of the cornea, wherein said intraocular lens is placed between the cornea and the capsular bag lens, anterior chamber, or room. 2.权利要求I的眼内透镜，其中像差包括散光、彗形像差和球面像差中的至少ー种。 The intraocular lens of claim I, wherein the aberrations including astigmatism, coma least ー species and spherical aberration in. 3.权利要求I的眼内透镜，其中构造成至少ー种非球面表面使预定的像差系数减小到预定的边界值以下。 The intraocular lens of claim I, wherein the at least ー configured so that a predetermined kind of aspherical surface coefficients of the aberration is reduced to the predetermined boundary value. 4.权利要求I的眼内透镜，其中眼内透镜的像差用查涅克多项式项的线性组合表示。 The intraocular lens of claim I, wherein the intraocular lens aberration is represented by a linear combination of Zernike polynomial terms. 5.权利要求4的眼内透镜，其中查涅克多项式项的线性组合包括查涅克系数an。 The intraocular lens of claim 4, wherein the linear combination of Zernike polynomial terms include Zernike coefficients an. 6.权利要求5的眼内透镜，其中选择查涅克系数an以减小穿过眼球的波前球面像差。 The intraocular lens of claim 5, wherein selecting an Zernike coefficient of a wavefront to reduce the spherical aberration of the eye through. 7.权利要求5的眼内透镜，其中选择查涅克系数an以便补偿由多人的角膜和囊内晶状体的查涅克系数an的预定评估数得到的平均值。 Zernike coefficient of a predetermined number of evaluation obtained an average of the intraocular lens of claim 5, wherein the selected Zernike coefficients an for more than compensated for by the cornea and the capsular bag lens. 8.权利要求5的眼内透镜，其中选择查涅克系数an以便补偿治疗对象单独的角膜和囊内晶状体系数。 The intraocular lens of claim 5, wherein the selected Zernike coefficients to compensate for the treatment of an object individual cornea and capsular bag lens coefficient. 9.权利要求I的眼内透镜，其中构造成至少ー种非球面表面以减小所选人群的至少ー项查涅克系数。 9. The intraocular lens of claim I, wherein the at least ー configured aspherical surface to reduce the kinds of groups selected Zernike coefficients ー least term. 10.权利要求I的眼内透镜，其中眼内透镜通过ー种或多种对确定光学部分晶状体形状起作用的參数来表征。 10. The intraocular lens as claimed in claim I, wherein the intraocular lens by ー or more parameters for determining the shape of the lens optical portion acting characterized. 11.权利要求I的眼内透镜，其中选择所述ー种或多种參数中的至少ー种參数使其充分偏离球面晶状体以补偿像差。 11. The intraocular lens as claimed in claim I, wherein said selected one or more parameters ー least ー types of parameters deviates sufficiently to compensate for the spherical aberration of the lens. 12. ー种眼内透镜，包括：为植入角膜和晶状体囊之间而构造成的光学部分；和至少ー种非球面表面，与眼的囊内晶状体结合，能够将穿过眼的角膜的波前转换为其中心在眼球视网膜上的基本上球形的波前，其中所述眼内透镜放置在角膜和囊内晶状体之间、前房或后房中。 12. ー species intraocular lenses, comprising: an implanted between the cornea and the lens capsule and an optical portion configured; ー species and at least an aspherical surface, the lens capsule in conjunction with the eye, through the cornea of ​​the eye can be wave before conversion to its center substantially spherical wavefront in the eye retina, wherein said intraocular lens is placed between the cornea and the capsular bag lens, anterior or posterior chamber. 13.权利要求12的眼内透镜，其中所述光学部分为植入眼的前房而构造成。 13. The intraocular lens as claimed in claim 12, wherein the optical portion of the implant and the anterior chamber of the eye to be configured. 14.权利要求12的眼内透镜，其中所述光学部分为植入眼的后房而构造成。 14. The intraocular lens as claimed in claim 12, wherein the optical portion of the posterior chamber intraocular implant constructed. 15. ー种眼内矫正透镜，具有至少ー个非球面表面，当其像差表示为多项式项的线性组合时，其与眼的囊内晶状体结合，能够减小穿过角膜的波前得到的类似的这种像差项，其中所述眼内矫正透镜放置在角膜和囊内晶状体之间、前房或后房中。 15. ー species intraocular correction lens having at least one aspherical surface ー, when the aberration is represented as a linear combination of polynomial terms, which in combination with the lens capsule of the eye, can be reduced to give the wave front through the cornea similar such aberration terms, wherein the intraocular correction lens is placed between the cornea and the capsular bag lens, anterior or posterior chamber. 16.根据权利要求15的眼内矫正透镜，其中所述非球面是透镜的前表面。 16. The intraocular corrective lens as claimed in claim 15, wherein said aspherical surface is a front surface of the lens. 17.根据权利要求15的眼内矫正透镜，其中所述非球面是透镜的后表面。 17. The intraocular corrective lens as claimed in claim 15, wherein said aspherical surface is a rear surface of the lens. 18.根据权利要求17的眼内矫正透镜，其中所述多项式项是查涅克多项式。 18. The intraocular corrective lens as claimed in claim 17, wherein said polynomial terms are Zernike polynomials. 19.根据权利要求18的眼内矫正透镜，该透镜能够减小代表球面像差和散光的多项式项。 19. The intraocular correction lens according to claim 18, the lens capable of reducing polynomial terms representative of spherical aberration and astigmatism. 20.根据权利要求19的眼内矫正透镜，该透镜能够减小第四阶像差的第十一项查涅克多项式项。 20. The intraocular corrective lens as claimed in claim 19, the lens can be reduced eleventh Zernike polynomial term of the fourth order aberrations. 21.根据权利要求20的眼内矫正透镜，该透镜由生物相容性软质材料制成。 21. The intraocular corrective lens as claimed in claim 20, the lens is made of a biocompatible soft material. 22.根据权利要求21的眼内矫正透镜，由硅氧烷制成。 22. The intraocular corrective lens as claimed in claim 21 and made of silicone. 23.根据权利要求21的眼内矫正透镜，由水凝胶制成。 23. The intraocular corrective lens as claimed in claim 21, made from a hydrogel. 24.根据权利要求20的眼内矫正透镜，由生物相容性硬质材料制成。 24. The intraocular corrective lens as claimed in claim 20, made from a biocompatible hard material. 25.根据权利要求15的眼内矫正透镜，适于植入虹膜和晶状体囊之间的眼的后房中，所述眼内矫正透镜包括能提供光学矫正的位于中心的光学部分，和位于边缘的支撑元件，所述支撑元件能够使所述光学部分保持在所述中心位置，所述光学部分和所述支撑元件均具有构成非球面的一部分的凹形后表面，所述非球面和任何包含光轴的平面之间的交叉线代表没有间断和变形点的完美曲线。 25. The intraocular corrective lens as claimed in claim 15, adapted for implantation into the posterior chamber of the eye between the iris and the lens capsule, the intraocular correction lens includes an optical portion can provide optical correction centrally located, and at the edge a support member, said support member capable of maintaining said optical part in said central location, said optical part and said support member has a concave portion constituting the aspherical surface, the aspherical surface and comprising any representative of the line of intersection between a plane and the optical axis without discontinuities perfect curve inflection point. 26.根据权利要求25的眼内矫正透镜，适于植入眼的前房，并固定于虹膜上。 26. The intraocular corrective lens as claimed in claim 25, suitable for implantation in the anterior chamber of the eye, and is fixed to the iris. 27. 一种提高眼的视觉质量的方法，其特征在于植入根据权利要求15至26的眼内矫正透镜。 27. A method of increasing the quality of the visual system, characterized in that the implantation of an intraocular correction lens according to claim 15-26 in claim. 28.根据权利要求27的方法，其中在眼球外面佩戴眼科透镜或眼科矫正透镜以进一歩提闻视觉质量。 28. The method according to claim 27, wherein the ophthalmic lens outside the eye or wearing corrective ophthalmic lenses into a ho smell mention visual quality. 29.根据权利要求27的方法，其中接受眼内矫正透镜的患者的角膜已借助于激光进行修正。 29. The method of claim 27, wherein the patient receiving the intraocular correction lens is corrected by means of laser cornea has.